Mem. Soc. Emul. Montbeliard Ser. II, 5: 243. 1872. Cap 0.5-1.5 cm broad, obtuse-conic to campanulate at maturity, sometimes with a low umbo; margin at first incurved, then decurved to level; surface pruinose, subviscid when moist, hygrophanous, translucent-striate, the cuticle separable; color grey-brown to grey, lighter towards the margin, often tinged bluish to bluish-grey when fresh, fading in age to pale greyish-tan; context greyish, about 1 mm at the disc; odor slightly pungent, taste mild. Gills ascending-adnate, close, narrow, at first whitish, then pale-grey, the edges white to pale-grey, minutely fringed; lamellulae in up to three series. Stipe 3.0-7.0 cm long, 1.0-3.0 mm thick, more or less equal, hollow, tubular; surface moist, not viscid, pruinose, becoming nearly glabrous in age, greyish-brown to greyish-tan, the base sometimes rooted, in youth frequently sheathed with a bluish-grey pubescence; partial veil absent. Spores 8.0-9.5 x 4.0-5.0 microns, broadly elliptical to tear-shaped in face-view, similar in profile but slightly inequilateral, smooth, thin-walled, hilar appendage not conspicuous, amyloid; spores whitish in deposit. 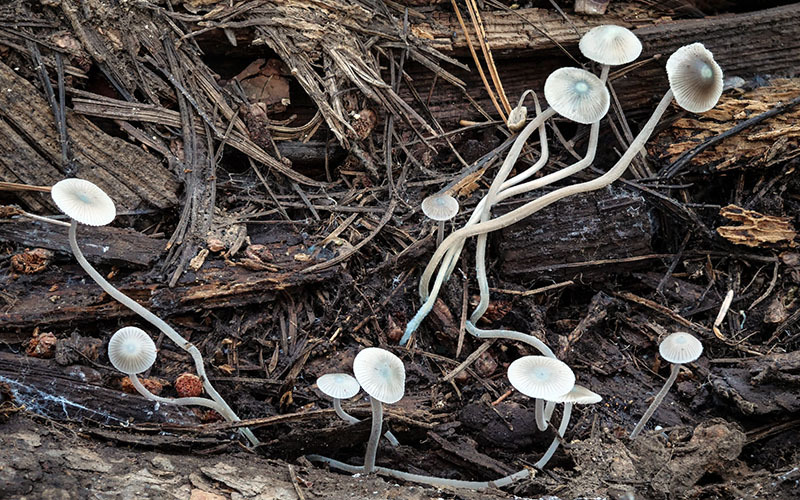 Solitary, scattered, to occasionally clustered on conifer logs (often under the bark) in montane regions; fruiting shortly after snowmelt in the spring; also occurring on woody debris of confers in coastal forests in the fall and winter; occasional, inconspicuous. Grey-brown Mycenas abound in California woodlands. Some species are gregarious on forest litter, while others fruit in troops or tufts on rotting logs. Many are difficult to identify without a microscope. 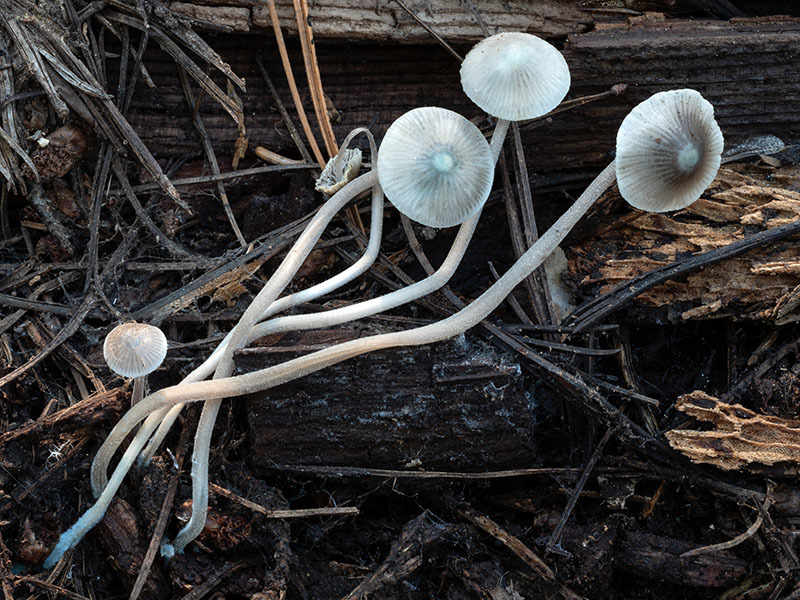 Mycena amicta is an exception, at least when young. 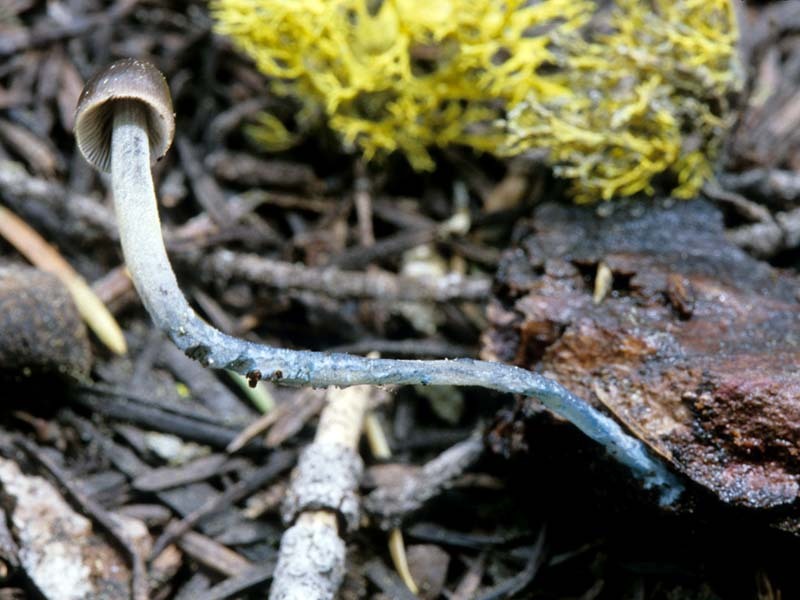 The cap of fresh specimens often shows bluish tints at the margin and disc, while the stipe base is frequently sheathed with bluish hairs and rooted when fruiting under bark. Unfortunately the bluish color which distinguishes the species is fleeting. Thus in old specimens a combination of characters is needed for an identification. These consist of a peelable, gelatinous cuticle, and at times, the formation of a collar-like ring by the gills at the stipe apex. Microscopically Mycena amicta is distinguished by the absence of pleurocystidia, cylindrical, clavate to subfusoid cheilocystidia and amyloid spores. 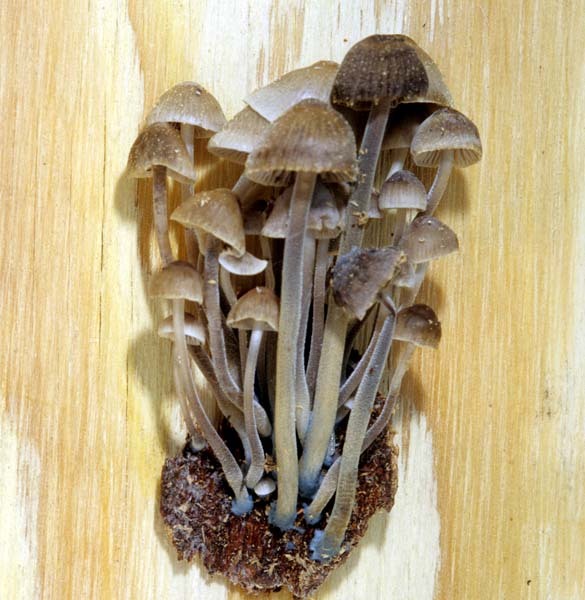 Other grey-brown Mycenas with distinctive macroscopic features include: Mycena maculata, found on conifer logs, developing rust-brown spots on the cap and gills; Mycena capillaripes, common on pine needles, with a strong bleach odor, usually with pinkish gill edges; Mycena citrinomarginata, a grass inhabitant with yellowish to yellowish-brown gill edges and a slight radish-like odor; Mycena galopus, often abundant in needle litter of Sequoia sempervirens (redwood), the cap brown at the disc, pale at the margin, exuding a milky juice from stipe base, and Mycena rorida, on conifer needles and sticks, with a dry, pale-grey to brown, pruinose cap, the stipe enclosed in a glutinous sheath when young. Smith, A.H. (1936). 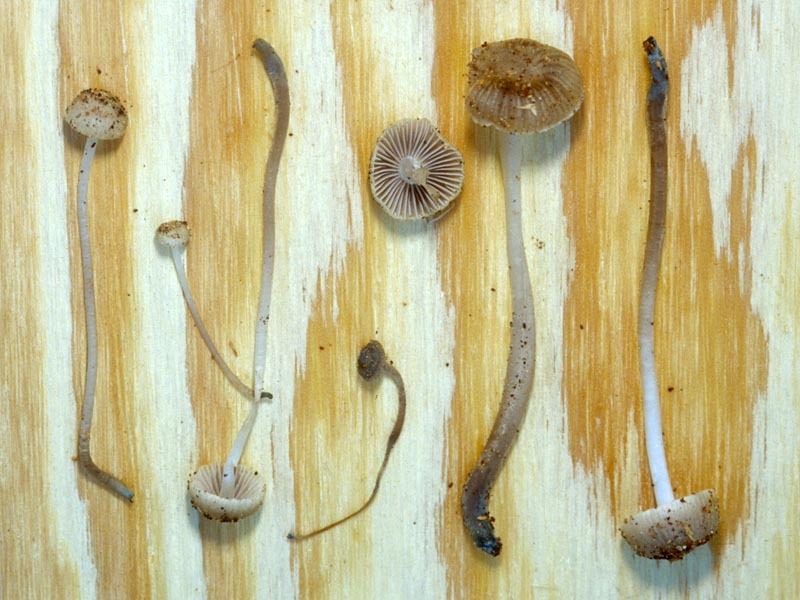 Studies in the Genus Mycena. III. Mycologia 28(5): 410-430.